As soon as I saw it, I immediately contacted Morgan and asked for permission to use this picture in my blog. That’s a first for me. I’ve never felt so moved as if to say, “you all NEED to see this picture”. 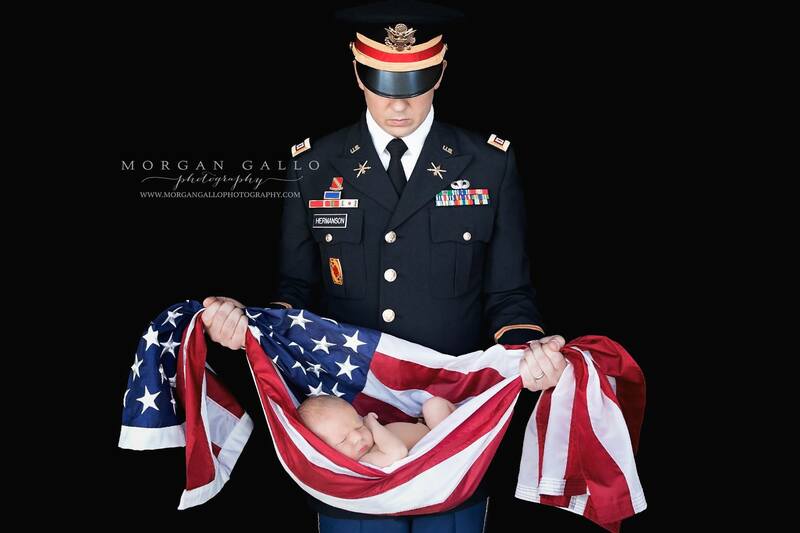 The picture was posted on Facebook, where I first saw it, in response to a different photograph that received a lot of negative comments regarding a baby wrapped up in a flag, held by her father. Some people claim that picture was offensive. As an Army mom, I beg to differ. When I look upon this picture, I see a father, who is proud to uphold the oath he took to protect our country. I see a father wrapping his newborn in the promise he made to all of us and is now extending that to his child. He is steadfast in his grip and has the strength to hold up his commitment. This babe, and countless others, are wrapped in the blanket of protection that our military selflessly provides in service to the United States. Wrapped in the symbol of freedom, strength, integrity, honor and patriotism. I am proud and humbled to be able to share this with you. Morgan has an amazing eye in which she can draw out such emotion from a single shot with her camera. She honors our military with her work. Please stop by her Facebook page, https://www.facebook.com/morgangallophotography and let her know if you’ve enjoyed this powerful and touching photograph as much as I have. A special thanks to our veterans, active duty, those who gave all and their families.